Esther, the unwilling queen, confronts us with a timeless question. Are we bold enough to walk in our true identity as God’s people? Or are we content to “live large in Babylon”? This week, the Jewish people observed Purim (POOR-ihm), a carnival-like celebration that commemorates the events of the Book of Esther. 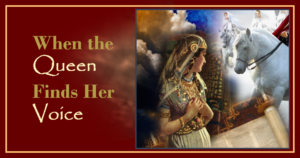 On the surface, Esther is a story of how the Lord transformed a meek young woman into a powerhouse and used her to deliver the Jewish people from a vicious enemy determined to annihilate them. But like most stories in the Hebrew Scriptures, the significance runs deeper—to the universal battle between God’s people and the ageless enemy who “walks about like roaring lion, seeking whom he may devour” (1 Pet 5:8). For me, Esther’s story has four key messages, and they’re as relevant today as ever. Much is made over the fact that the Book of Esther is the only book of the Tanakh [the Hebrew Scriptures] that does not explicitly mention the name of God. However, the idea of God’s sovereignty and hashgachah (divine providence) is clearly implied throughout the entire story. God is always at work. But sometimes He works offstage. This is especially likely if we’re hidden believers, “denying Him before men” (Matt 10:33). Our story begins when Mordecai, a Jew living in Babylonian captivity, adopts his orphaned cousin Esther. I always assumed they were exemplary Jews, to get a whole book of the Bible devoted to their story. But in fact there are a lot of clues that Mordecai and Esther started out as survivors, snugly assimilated into the pagan culture around them. The events took place at least fifty and possibly a hundred years after Cyrus released the Jews to return to Israel. Jews did return, but not in great numbers. The majority, like Mordecai, decided it was more comfortable to stay in Babylon than to obey the Lord’s call to rebuild their decimated land. Once she’d been “gathered,” Esther obeyed Mordecai’s instructions not to reveal her Jewish identity. It’s hard to imagine how she could have managed this without violating the Torah. This stands in stark contrast to the care Daniel took to keep the Torah’s dietary laws at the court of the Persian king (Dan 1:8). Well, guess what happens when we refuse to bow to the “little-g” gods of this world? They get hopping mad! Or consider this headline from Iran, a.k.a. modern-day Persia. Did you know that International Quds Day, which loosely translates to “Death to the Occupiers of Jerusalem Day,” is an official annual Ramadan observance in much of the Muslim world–especially in Iran? Haman serves as an infamous type of the forces that array themselves against all of God’s people. If they can’t disable us through creeping compromise, they turn on us to destroy us. Esther’s story is familiar enough that I don’t think I need to detail it here. By all means, read the book if you haven’t read it recently! It’s exciting! But, spoiler alert: Haman’s plans backfire—badly—and God wins. Our God is always able, more than able, to shepherd His people to their destiny. The enemies of Israel will not prosper in the end. Nor will those who attempt to derail the people of His New Covenant. After a three-day fast that began at Passover, by God’s grace Esther exposed Haman. The Jews were delivered. After three days in the tomb that began at Passover, Christ overcame sin and death. We stand redeemed. According to sages, any day that is marked by special deliverance by the Lord can be called a “Purim.” In fact, Yom Kippur (the Day of Atonement) is also knows as Yom Kippurim in the Tanakh (Hebrew Scriptures), which can be read as Yom Ke-Purim, a “day like Purim.” Thus, the day on which Yeshua sacrificed Himself on the cross is the greatest Purim of all, since through this we are eternally delivered from the hands of our enemies. Those who’ve been with me for a while know I often blog on Hebrew calendar. This post on Purim completes the cycle—I’ve blogged now through the entire year of Jewish feasts. Reflecting back, the education for me has been fabulous. And I hope I’ve managed to share some of that excitement with you! Seeing the way God has worked through history, so precisely according to the calendar He put in place at Creation, speaks volumes to me about His sovereignty over the course of human events. Again, no coincidences. Gaining a better understanding of the Feasts has shed new light for me on many aspects of Christ’s ministry, especially as recorded in the Book of John. 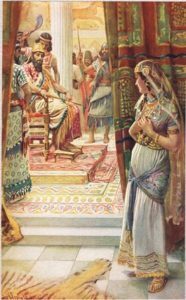 A couple weeks ago, my Valentine’s Day post featured another iconic woman from the Hebrew Scriptures: the bride from the Song of Solomon. She confronts me with a question. The preoccupied bride who’s all about her own comfort. When He shows up at an inconvenient time, she takes so long to open the door that he goes away into the damp night! 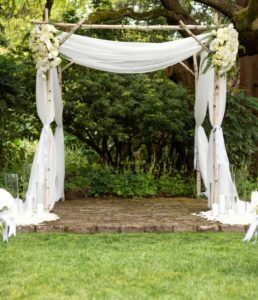 So if Christ is our Heavenly Bridegroom, which bride are we?? Is God our all-in-all, or a passing affair to swoon over when it suits us? Mordecai and Esther confront me with the same question. Which Esther am I? Am I the “before” Esther, hesitant to ruffle feathers while I’m living large in Babylon? Or the “after” Esther, walking without apology in my identity as a woman of God? Or… which virgin? The wise virgin who illuminates the path with my personal lamp filled with oil? Or the foolish one left standing outside in the dark? When our Lord returns—soon and very soon—to claim His bride, I know which one I want to be! I used to wish I could have been alive when Jesus of Nazareth walked the earth. 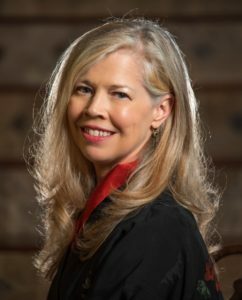 How amazing would it have been to see “the Word made flesh”? But I’ve come to realize that the days in which we live are just as prophetically significant. I know every one of us is here because God has some special work for us. What a privilege to be placed here now, “for such a time as this” (Est 4:14)! I pray regularly that I won’t miss a single nuance of the good works God has prepared beforehand for me (Eph 2:10)–and I pray that for you too. Simple… But no one said living it out will be easy. Especially now, in these last days. I’m delighted it blessed you, Afam! Always uplifting. I think I missed some in the series. I need to go back and read them. May the Lord inspire your next series and through it bring us deliverance from our enemies through hope in our Savior and His soon return. Linda, thank you for sharing this important and powerful message. May the Lord continue to bless you as you serve Him through your words of wisdom.